Please see the attachment and visit the Education College Council (ECC) Facebook page for more information. The Counseling Program will be holding an open house for all program areas (Mental Health; Marriage, Couple, and Family therapy; School Counseling, and PhD in Counselor Ed) on September 21. Please see attachment for additional details. 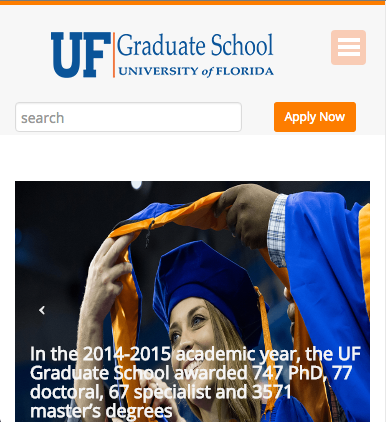 The Undergraduate Research Expo is an annual exposition of research conducted by faculty members and graduate students at the University of Florida. The purpose of this event is to introduce undergraduates to research faculty in a meet and greet-style setting. 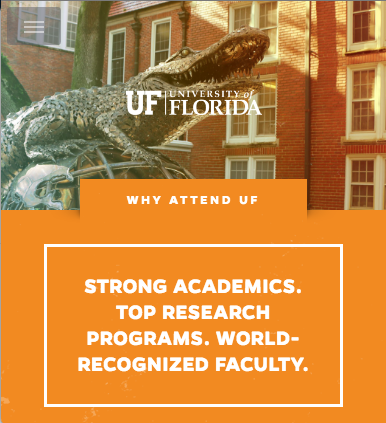 We hope to introduce students to the diversity of research conducted at UF, allow students to network with research faculty members, and present recruitment opportunities for undergraduate researchers. Faculty and graduate students from all fields are invited to this meet and greet. Please register here. Volusia County Schools will be hosting an invitation only, instructional job fair to hire talented teachers. All certifications are welcome to apply. Prior certifications listed here. To express your interest in being considered for an invitation to this job fair, complete all steps listed below prior to noon on Thursday, October 25. Additional resources for candidates can be found on our webpage www.myvolusiaschools.org. This semester the Career Connections Center, formerly known as the Career Resource Center, will be facilitating The Career Success Institute. The Career Success Institute (CSI) is a six-week cohort-based program to help students identify their strengths, values, and career options and how to set actionable goals for the future. CSI gives students the opportunity to get involved with fellow students, develop leadership strengths, and help design a student’s future. Participants in CSI will receive a career assessment, Gator Pin, professional headshot, and more! The CSI application can be found at career.ufl.edu/csi. 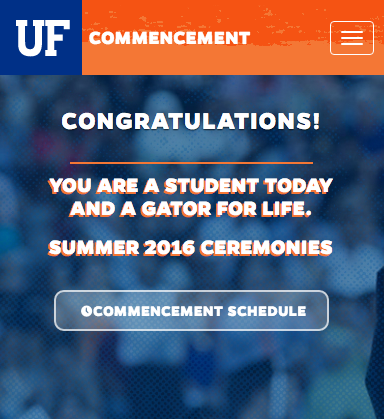 Register for LeadUF Today! Registration will close on Friday, September 14 or when space is full. The AERA Grants Program is currently accepting proposals for both its Dissertation and Research Grants. With support from the National Science Foundation (NSF), the AERA Grants Program provides dissertation grants to graduate students and small research grants to doctoral level scholars using large-scale data sets in their research. Complete details located on the attachment. The UF Teaching Center offers this workshop Monday through Thursday, October 8-11, from 5-7 p.m. each day. The Math sessions are Monday & Wednesday, and the Verbal sessions are Tuesday and Thursday. You can register for just the math sessions, just the verbal sessions, or all four. Go to www.teachingcenter.ufl.edu, then “study skills” then “workshops” to register and learn the workshop location. The City of Gainesville announced that its volunteer portal serveGNV.org is now live. ServeGNV is a web-based platform to connect local nonprofits and other agencies in the area to local volunteers. The link to the portal is here. For more information about the portal, I have the link to their press release here. Florida State University and the Florida Center for Reading Research (FCRR) are currently conducting a research project in the state of Florida and looking for Interventionists in Alachua County. The position is part time with flexible hours and will give hands on experience with Intervention on the Elementary school level. Please see attachment for additional details. If interested, please contact Site Coordinator for Marion-Alachua County, Kathy Williams at kawilliams@fcrr.org. Seeking part-time and substitute teachers who are interested in working with infant, toddler, and/or pre-school age children. Childcare experience is not required but preferred. Teachers will have to be able to pass a level 2 Department of Children and Family Background check and a drug screening before they are hired. They must also complete the DCF Childcare Training Requirements within 90 days of their hire date. If you are interested, email your resume to Jason Hill, Head of School at Jason@htesgnv.org. Please include your hours of availability and past five years of work experience. You can find out more about their school by visiting, www.htesgnv.org. Looking for students to help out at the PK Yonge Fall Carnival. If you are not able to do the entire three-hour shift, we can figure out some shifts that you can do. We will take all of the volunteers we can get. The more volunteers we get, the less parents are needed giving them time to spend with their children at the carnival. If you are able to help out, please email Volunteer Coordinator Danica Faulkner at pkyptodanica@earthlink.net or text her at 352-214-8203. This program is part of the Forest Service’s More Kids in the Woods initiative, which was launched to promote increased outdoor activity among children. We rely on many volunteers to help with this program every year. And although it is a science-based program, a background in science isn’t required; the main role of the volunteers is to help the students learn outdoors, and guide them when they need assistance. Further details and contact information on the attachment. One Heart Source is currently accepting applications for our 2019 Education & Social Work programs in South Africa! Students and alumni of University of Florida are invited to participate in a service-immersion program with One Heart Source in South Africa this summer. Over 1,000 students from over 100 universities (from Harvard to Hong Kong) have served abroad with One Heart Source and gained the skills, experience, and network to empower them towards personal and educational success. Students who participate will serve as academic mentors to vulnerable youth in South Africa. As students of Education, this program is relevant and provides important field experience while examining education on a global scale and developing culturally responsive educators. Attention students interested in working with young children ages 0-5 and/or ministry, we have a volunteer opportunity for you! The local non profit Christian Mom’s Support group Mothers of Pre-Schoolers (MOPS) of Shift Church is a Christian ministry seeking to connect moms from all around the world to a community of women in their neighborhood and community. Additional details here. Promoting Literacy through Tutoring and Mentoring is seeking persons to provide tutoring and mentoring to students in the Gainesville area. The organization will host an event to strategize recruitment on Thursday, September 13th from 6:00-7:30pm at the Martin Luther King Center, 1028 NE 14 Street, Gainesville, FL. To volunteer, please contact: GainesvilleThrives@gmail.com or 352.358.1877. To learn more, visit GainesvilleThrives.org. The AWARE ambassadors are currently recruiting new members. We are the mental health ambassador program for the University of Florida and we are run by the Counseling and Wellness Center. Our mission is to provide wellness and mental health awareness outreach initiatives for the UF community and surrounding Gainesville area, as well as reduce the stigma towards seeking mental health resources and services. 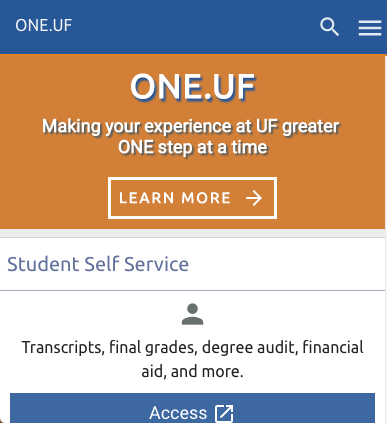 More information and the application are available at: https://counseling.ufl.edu/outreach/aware/. The deadline for application is Tuesday, September 4th at 11:59pm. Please email us at: cwc-aware@mail.ufl.edu with any questions. If you love kids and are looking for a way to get involved, then consider volunteering with the Gator Junior Golf Association, Gainesville’s only non-profit junior golf program! As a volunteer, you would be mentoring and helping kids ages 5-14 to develop both golf skills and life skills that can be used on and off the course. Only basic golf knowledge is required. If interested, please visit our website, https://gatorjuniorgolf.org/become-a-volunteer/, for more info or email Tori Look at gatorjuniorgolfassociation@gmail.com. I am looking for a student who can assist with my autistic son in the afternoons. He is age 16 and is a great kid. The work would be every other week for the most part. Any student interested, please contact Jonathan Culver at 352-207-5500. Afternoon babysitter needed for faculty family for two boys (11 and 8). This would entail picking up from their school bus stop at Westside Park at 3:25 on most days to bring to our home near campus, plus driving to or picking up from after-school activities in town. At home there is homework supervision and game-playing. A warm and child-friendly personality, tolerance for a rambunctious puppy, punctuality, and an excellent driving record are required. The job is Monday-Thursday, 3:25-5:30 or 6, $12 per hour plus gas. If interested, please contact Michelle at michelle.u.campos@gmail.com, or 352-727-1243. I have a nine year old son who is rather bright and is in a Gifted Magnet program. He needs a nanny to be with him everyday after school (1:42 pm – 5:30pm) including car pick up. I would love to hear from interested students at 352-672-3199. Our one and a half year-old son is the light of our life. He is a wonderful person to be around and we need a little assistance with him due to our active lifestyles. Both parents are business owners and have demanding schedules. We want to spend as much QUALITY TIME with our baby and need some help. We are looking for 1-2 people who are experienced to aid in continuing his positive growth and development and would also like to share the working schedule (because we know how busy your academic schedules can be). We need help during both early mornings and weekday afternoons. The schedules and pay rate/hour will be discussed in person. If you are interested please email us at jasonandxinjie@gmail.com. Thank you. My child is currently in the 5th grade and is struggling in reading as well in math. I would like to have a tutor twice a week for a hour to a hour and a half. If available, please give Brandye a call as soon as possible at (352) 246-7870. Starting in August: Babysitter needed for 2 boys ages 13 & 11, Monday, Tuesday and Friday afternoons (3-4pm on M and T. Friday until 4:30) .Hired sitter will pick up boys from their respective schools. Schools near each other. Good driving record a must. Rate: $10.00 an hour. Other sitting opportunities may occur as current sitters schedules change. pEmail: michelesstone@gmail.com.